When I arrived in Doha late in the night, the first thing I noticed was the Dubaiesque feel of the city. The landscape of this capital city was accentuated by the soft glow of lights from the attractive high-rise buildings overlooking the Corniche around Doha Bay. It was indeed a beautiful and welcoming site and a testimony to the wealth of Qatar. 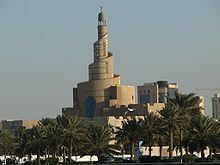 Driving around town the following morning revealed a whole new landscape, including the beautiful Spiral Mosque and the Souk Waqif, the oldest Arabian-style market in Qatar. When I looked at my friend’s map in the car, all of the popular landmarks were circled because they form the constellation that makes it easier to navigate around town (one of the advantages of landmarks). And, Qatar is certainly sparing no expense in adding new stars to this constellation of buildings and towers and enhancements to natural features. It is indeed a beautiful oasis on the Arabian subcontinent. As I lay in bed last night my thoughts turned to the importance of landmarks. Each of us have landmarks on the geography of our own lives — erected during those defining moments of accomplishments and defeats, births and deaths, celebrations and evaluations. These are the places that can be seen and recognized from a distance and enable us to establish our location. These are the places where reflection enables us to consider how far we have come or how far we need to go. I know some who are satisfied with the landscape of their lives and have comfortably settled in with no desire to venture toward the next horizon. And I know others who continue to press on, slowly redefining the geography of their lives by erecting new landmarks of accomplishments and even defeats, both of which are a part of the journey. Regardless of who we are or where we are, we need to determine whether we are satisfied with the geography of our lives. Those who attend our funeral will review the map of our lives and visit the landmarks that we leave behind. Will they conclude that we loved well and served others or that we were we so self-absorbed that we ignored the needs of those around us? What will they learn from our accomplishments and defeats? What landmarks will we leave behind that will inspire others or serve as a cautionary tale of poor choices? While there is still time, make it a point to erect the kind of defining landmarks that will help and encourage and bless those who come after you. Leave the kind of map that will inspire others to study and circle your landmarks so that they can safely find their way on their own journey. Thanks Omar, I needed this encouragement after a very trying week working with senior adults that need the love of Jesus portrayed in their lives. Many of whom have lost sight of what He has to offer them. Many of them have struggled and have been beaten down by life’s battles and have lost sight of “hope in Chirst.” I pray humbly that God will choose me to shine His light here on earth. Thanks for caring for these senior adults and for treating them with the dignity and respect they deserve. You are indeed building a great landmark of service that can and will encourage others. Blessings to you. As always, I enjoy the beautiful photography and your succinct and clear writing style.